The Midland Metro Alliance won two awards at prestigious events held in London and the West Midlands on Wednesday 10 October. 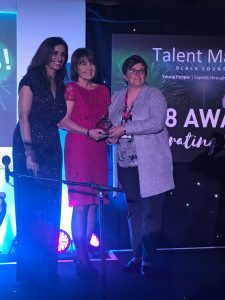 The first award was for Employer of the Year at Talent Match Black Country’s Annual Awards and Celebration which was held at the Molineux Stadium in Wolverhampton. Talent Match recognised the organisation for projects which help to get the careers of local people on the right track. The Midland Metro Alliance, working in partnership with local colleges, the Department for Work and Pensions, councils and other funding bodies, supported the design and delivery of bespoke six-week courses in light rail last year. These programmes offered unemployed candidates across the region an opportunity to achieve accredited qualifications and gain practical work experience, and on successful completion, a guaranteed interview for a variety of roles available at the organisation. In addition, throughout spring 2018 the team developed an initiative to deliver sector specific career advice to local young people, parents and teachers across the region. 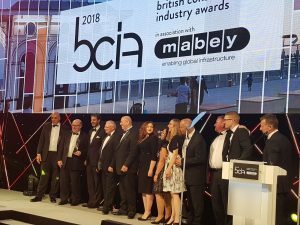 The accolade was not the only one the team walked away with as the Midland Metro Alliance was also announced as the winner of the Partnership Initiative of the Year category of New Civil Engineer’s annual British Construction Industry Awards 2018 held at Grosvenor House Hotel in London. Judges commented that the Midland Metro Alliance was an innovative example of a move away from traditional alliancing but one in which collaboration was at the heart of all of its actions.